“You win some and you lose some”, but how you adapt is what builds the foundation of a championship-caliber program. The 56th running of the Rolex 24 Hours of Daytona saw Wright Motorsports choose perseverance by pushing the No. 58 Porsche 911 GT3 R of Patrick Long, Christina Nielsen, Robert Renauer, and Mathieu Jaminet to the checkered flag following a formation lap incident. Just prior to the drop of the green flag for Saturday’s Rolex 24, things took a turn for the worse when the No. 58 Porsche 911 GT3 R made contact with the barriers between turns four and five. This left the car with significant damage to the left front corner, but with 24-hours on the clock the John Wright-led team wasn’t prepared to back down. Following a two-hour and eight-minute repair, with all hands on deck, the Porsche entered the race 81-laps down. From there, it was all about the big picture – championship points. With that at stake, the Ohio-based team didn’t miss a beat. 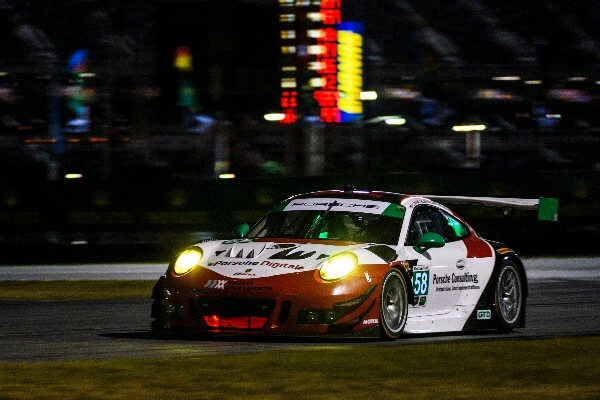 The crew completed flawless pit stops, each of the four drivers saw some of the quickest GT Daytona laps and the Porsche performed at a level that would’ve been deemed as highly competitive. Through attrition and a mistake-free remainder of the race, the Wright Motorsports team ultimately saw the checkered flag from the nineteenth position. This allowed them to not only earn valuable championship points, but to grow closer as a unit and develop important skills by enduring with a variety of conditions throughout a less pressure-filled race. With that, Wright Motorsports has every intention of returning stronger than ever March 14-17 for the Mobil 1 Twelve Hours of Sebring.